Digiarty Software rolls out WinX DVD Ripper Platinum 8.8.1 to support DVD to iPhone xS / Xs Max / XR conversion. This is a great step forward for the realization of playback DVD movie on the biggest-ever iPhone screen anywhere without WiFi or cellular connection. Sept.17, 2018 -- Digiarty Software pushes out a heartening update on WinX DVD Ripper Platinum, on the heels of Apple Event 2018. The fire new version embraces all the three flag high-end phones such that users can convert any DVD to the iPhone Xs, iPhone Xs Max or iPhone XR supported video file in just a few clicks. Now users can enjoy a 45% off discount to get the DVD ripper software during Digiarty Windows 10 DVD Ripper Sales. WinX DVD Ripper Platinum Ver.8.8.1 built on September 17, 2018 added a device profile "iPhone Xs/Max, XR (H264)" under Apple Device category. Without the need to change the parameters, user's original DVD can be digitized into MP4 format with H264 (AVC Baseline) + AAC codec at 16:9 aspect ratio that is seamlessly compatible with iOS devices. Both the windows and Mac versions are synced with the addition. All the three new iPhones are optimized for better video-watching experience. Among them, iPhone Xs Max offers the biggest display and the biggest battery ever in an iPhone. User can watch an hour and a half feature-length DVD movie on it without recharging. Besides, the all-screen Super Retina display, the OLED design with million-to-one contrast ratio, as well as the support for DVD's Dolby audio effect together make Xs Max the second-to-none viewing carrier. The next-generation DVD to iPhone ripper, picked up by millions of users is well known for its matchless fast speed. "According to our very recent test", says Jobs Dong, Development Director of Windows Platform of the software vendor, "the software-only DVD to iPhone Xs conversion averages 130 fps, and GPU-accelerated transcoding can reach 400 fps with the dubbed Level-3 Hardware Acceleration." 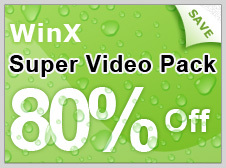 WinX DVD Ripper Platinum (and the Mac version: WinX DVD Ripper for Mac) developed by Digiarty Software, specializes in converting 99-title DVD to video audio, including DVD to MP4, AVI, WMV, MPEG, MOV, M4V, MP3, AAC and AC3/DTS. Its DVD backup mode will facilitate super-speedy DVD to ISO image file, VIDEO_TS folder and MPEG2 copy while maintaining original quality, content (menu, chapters) and complete video / audio / subtitle tracks. The 350+ built-in profiles cover all the mainstream and up-to-date gadgets. "Already in a completely stable stage, the software is free of frequent bug fixes. But once there is a related new technology, we will not hesitate to catch up with", Dong added. Added: The support for converting ISO image / DVD to iPhone Xs, Xs Max and XR. Improved: The main title checking mechanism to embrace new multi-title DVD movies. Enhanced: The DVD backup speed by optimizing internal duplication algorithm, much faster than before. During Digiarty Sales 2018, a 45% off coupon for the latest WinX DVD Ripper Platinum, costing only $39.95 for full version, is available for all visitors to: https://www.winxdvd.com/specialoffer/windows-10-dvd-ripper.htm.